How to Make Money Without Money? 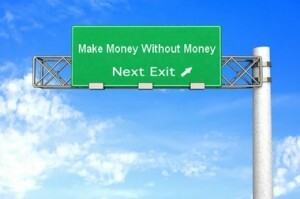 So, you want to know how to make money without money! I am glad you are. I personally don’t believe in that nonsense of “you need money to make money” theory. Go to Fiverr.com and sign up for a free account (if you already don’t have one). Fiverr is a micro freelancing marketplace where people sell all kinds of services for just 5 bucks. Search and find a seller on Fiverr who is offering some kind of gig that you know you can resell for a profit. A good resalable gig would be those video testimonials offered on Fiverr. There are lots of Fiverr sellers who will record a 30 seconds or so video testimonials about whatever product or services you tell them to. Find a seller that has some good feedback. Go to Craigslist or any other classified ads site like Backpage and post an ad offering video testimonial creation for say $50. You can also hit classified sections of online forums as well. But Craigslist will probably give you much more results. CL gets so much traffic that if you know what to do its easy to make money with Craigslist. Place your ad in the right section and in front of people who may need your service and you will soon start to receive emails. If you close even 1 deal out of every 10 emails, you make $45 profit (assuming you resell the gig for $50). Now, since you want to make money without any money, you are going to somehow convince the buyer to pay you at least $5 upfront so you can pay your Fiverr guy. I know that’s not an easy thing to fly with most people. But hey, if you can’t even manage to gather $5, that’s your only choice. Make sure you get all the details from the customer. Most will probably give you a script to read in the video. So, be sure you get all the necessary information from the buyer. Once you have the $5, go back to Fiverr and order the original gig. Give the seller the information (or script) you got from your buyer. Once the Fiverr seller delivers the work, all you have to do is to deliver it to your buyer and collect rest of your money. It really can’t get any easier than this. The cool thing is that there are lost of these kinds of so called “resalable”gigs that you can target. Logo design, website design, SEO work and video testimonials are just a handful of gigs that can be resold for a profit. It would be good idea to put up a simple website (like a portfolio kind of page) when you make some money in the beginning. Having a website will make you look more professional, thus increasing your chances of closing more details. You can also use the same testimonial creator on Fiver to actually make a testimonial for your own site. It will help increase your sales. There are tons of ways to make money from home without spending money. You just have to think out side of the box and not be afraid of doing some leg work. I know a few folks who use this exact system to make money without money.